According to SYFY, Warner Bros. 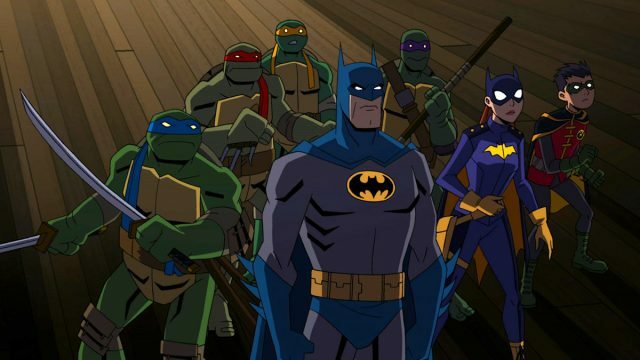 Animation and Warner Home Entertainment are collaborating together with DC Entertainment and Nickelodeon for a brand new animated movie crossover titled Batman vs. Teenage Mutant Ninja Turtles, which is based off James Tynion IV and Freddie William II’s comics miniseries Batman/Teenage Mutant Ninja Turtles. Batman vs. Teenage Mutant Ninja Turtles will follow the turtles meeting Batman for the first time via a transdimensional encounter, and feature our heroes teaming up to face Batman’s deadly rogues gallery. The unexpected crossover movie between the two iconic characters will be featuring a stellar voice cast that includes Troy Baker as both Batman and The Joker, Golden Globe winner Darren Criss as Raphael, Kyle Mooney (Saturday Night Live) as Michelangelo, Baron Vaughn (Grace and Frankie) as Donatello, Eric Bauza (The Woody Woodpecker Show) as Leonardo. It will also feature the voices of Rachel Bloom (Crazy Ex-Girlfriend) as Batgirl, Tom Kenny (Spongebob Squarepants) as The Penguin, John DiMaggio (Adventure Time) as Mr. Freeze, Tara Strong (The Powerpuff Girls) as both Harley Quinn and Poison Ivy, Carlos Alazraqui (Reno 911!) as Bane, and Cas Anvar (The Expanse) as Ra’s al Ghul. The animated film will be release sometime this spring on 4K, Blu-ray and Digital. The post Batman vs. Teenage Mutant Ninja Turtles Crossover Movie Announced! appeared first on ComingSoon.net.